24 cm xiii, 265 p. : ill. Previous ed. : published as Immigration, 'race' and ethnicity in contemporary France. 1995. 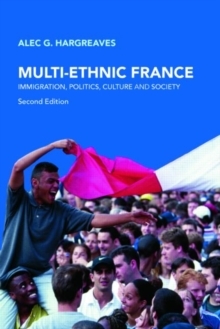 This new edition of "Multi-Ethnic France" spans politics and economics, social structures and cultural practices and has been updated to cover events which have occurred on the national and international stage since the first edition was published. These include: recent developments in the "banlieues" including the riots of 2005; the growing visibility of sub-Saharan Africans in France's evolving ethnic mix; the reverberations in France of international developments such as 9/11, the second Intifada and the Iraq Wars; the renewed controversy over the wearing of the Islamic headscarf; and the development of anti-discrimination policy and the debate over 'positive discrimination'. Immigration is one of the most significant and persistent issues in contemporary France. It has become central to political debate with the rise, on one side, of Jean-Marie Le Pen's extreme right-wing party and, on the other, of Islamist terrorism. In "Multi-Ethnic France", Alec G. Hargreaves unmasks the prejudices and misconceptions faced by minorities of Muslim heritage and lays bare the social and political neglect behind the riots of 2005. Including a glossary and chronology, a fully updated bibliography, and information on internet sites, this second edition is essential reading.